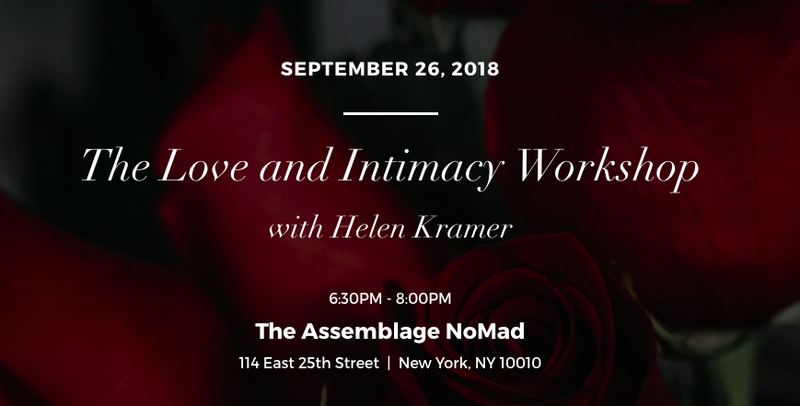 Join me at The Assemblage Nomad, 114 East 25th St., 6:30-8:00 PM on Wednesday, Sept. 26, for "The Love and Intimacy Workshop," the first of interactive and intimate courses I am organizing for my new "Reprogramming for Liberation" series. This is chapter one – the foundation for building a beautiful pathway towards a whole liberation – a toolkit for understanding the physiological and emotional complexities surrounding the way we understand and accept love and intimacy into our lives. I will help to demystify the act of falling and growing in love through a deeper understanding of neuroplasticity and our personal patterns formed in early development. I will then guide a workshop through unraveling and unlearning these patterns with actionable and easy-to-maintain practices to enhance our daily lives and lasting relationships. Visit this link below and enter the code "LETSGETINTIMATE"